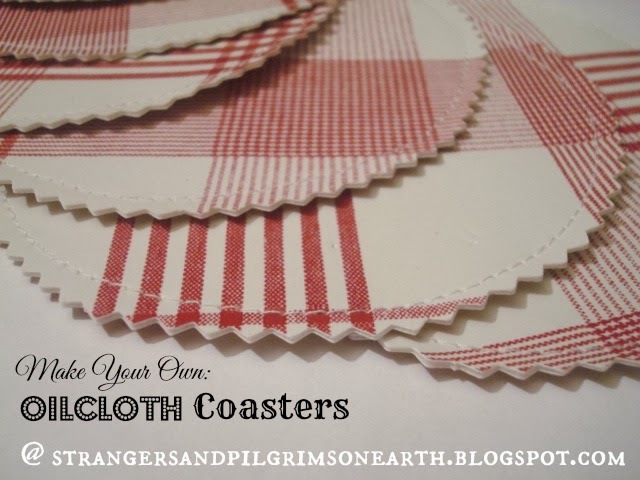 I love these little coasters! 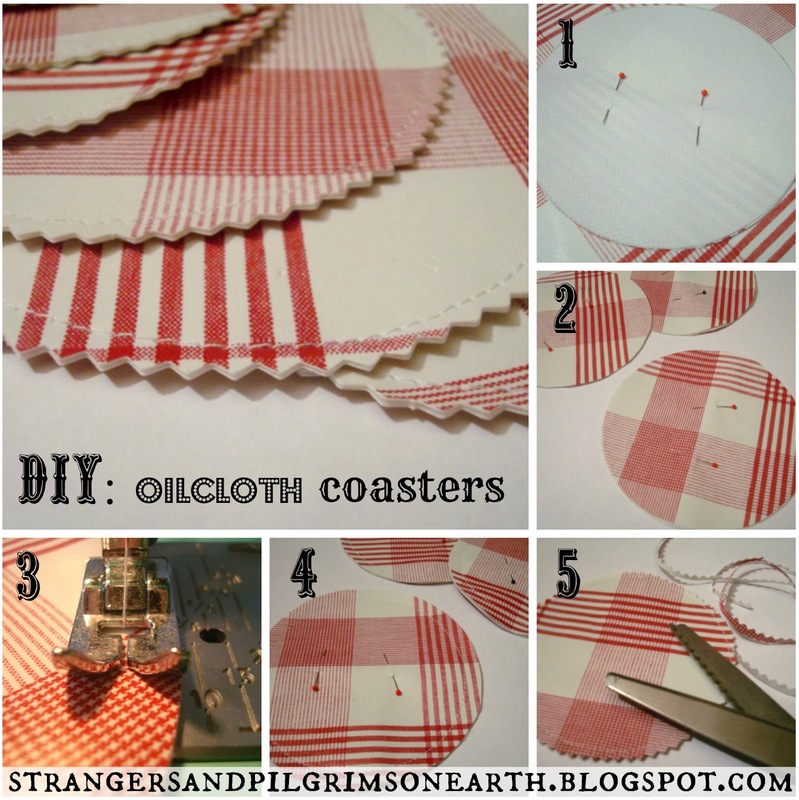 They are made with the leftover oilcloth from our kitchen table. They are toddler-proof (for the most part) since they can't be broken or cracked. They can't be used as a frisbee to clock someone in the forehead like our old ones. Alas, these are user-friendly, wipe-friendly and make-friendly. 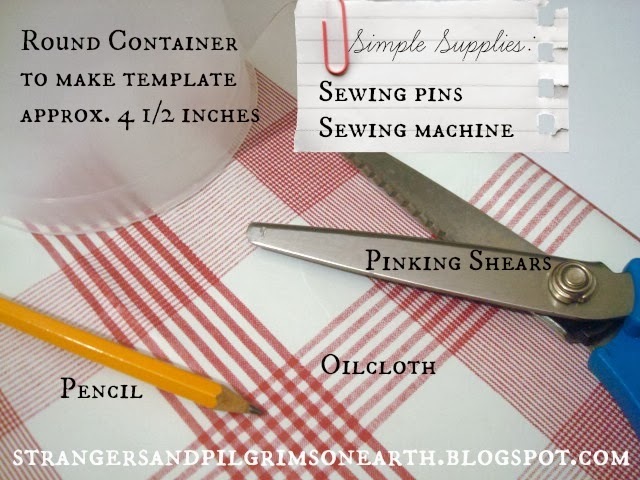 Using your round template, trace out two circles of oilcloth and cut to size. 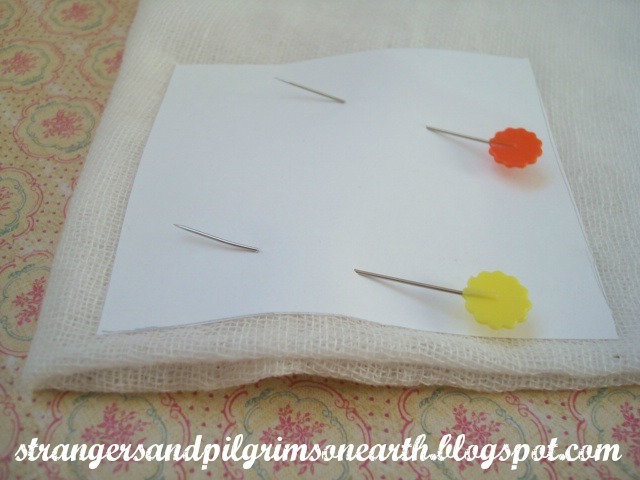 Place under-sides of two circles together and pin in place. 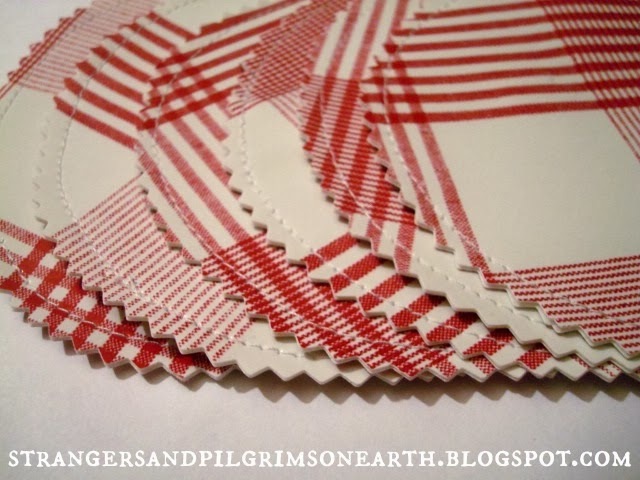 Sew them together around the edge of the circle as shown in figure "3". Cut around the rim of the circle with pinking shears to make a pretty edge (making sure you don't snip the seam) and you are finished! You can place them directly on your coffee table, stacked up, nice and pretty. Or, you can put them inside a tiny basket or tray. For a simple sewing project for baby, visit here. Our parents first in Paradise began." This post may be shared with some or all of the following link-ups: Modest Mom Monday's, Homestead Barn Hop, Teach Me Tuesday, Raising Homemakers, Make Bake Create, Wise Woman Link Up, Christian Homemaking, Wildcrafting Wednesday, Frugal Days, Sustainable Ways, Homemaking Wednesdays, Homemaking Thursdays, From the Farm Blog Hop, Farmgirl Friday and the Clever Chicks Blog Hop. Thank you lovely ladies for hosting these. This project was inspired by Martha Stewart. Did you plant broccoli this year? Perhaps you stocked up at a Farmer's Market? In any case, here is a delicious vegetarian recipe that my sister-in-law shared with me, which I would like to pass on to you. It also co-stars the lemon which makes it a perfect addition to our citrus series this winter. If you love a quick dinner dish, this is it! The original recipe is from the "Barefoot Contessa" (you can find it here). 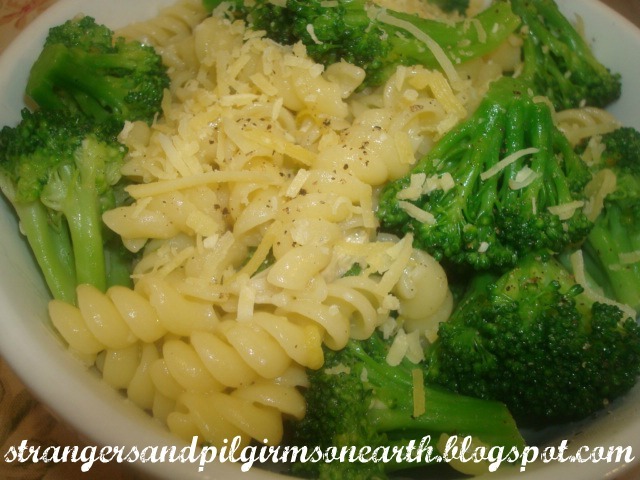 We simply added more broccoli and used less pasta when we prepared ours. We also excluded the pine-nuts (too expensive) and utilize whatever pasta we have on hand (hence the spiral in this picture). The parmesan cheese, however, is a must in my humble opinion. Bon Appétit ladies! This post may be shared with some or all of the following link-ups: Modest Mom Monday's, Homestead Barn Hop, Teach Me Tuesday, Raising Homemakers, Make Bake Create, Wise Woman Link Up, Christian Homemaking, Wildcrafting Wednesday, Frugal Days, Sustainable Ways, Homemaking Wednesdays, Homemaking Thursdays, From the Farm Blog Hop, Farmgirl Friday, Clever Chicks Blog Hop and Deep Roots at Home. Thank you lovely ladies for hosting these. "The most creative job in the world involves fashion, decorating, recreation, education, transportation, psychology, romance, cuisine, literature, art, economics, government, pediatrics, geriatrics, entertainment, maintenance, purchasing, law, religion, energy and management. Anyone who can handle all those has to be somebody special. She is. 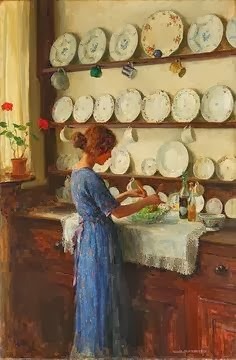 She's a homemaker." 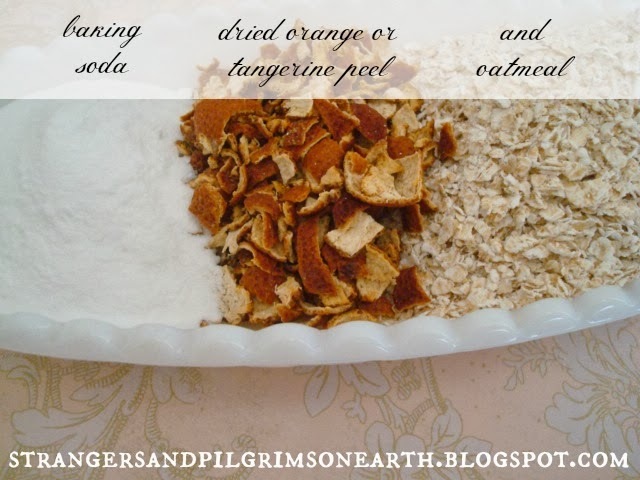 Here is another citrus project featuring the orange or tangerine peel that you can do while they are in season (and therefore affordable or free) ~ I love products created from simple pantry ingredients and this bath powder can be made in minutes. Who says that being a keeper at home is dull? It's a lot of fun to create concoctions in the kitchen! 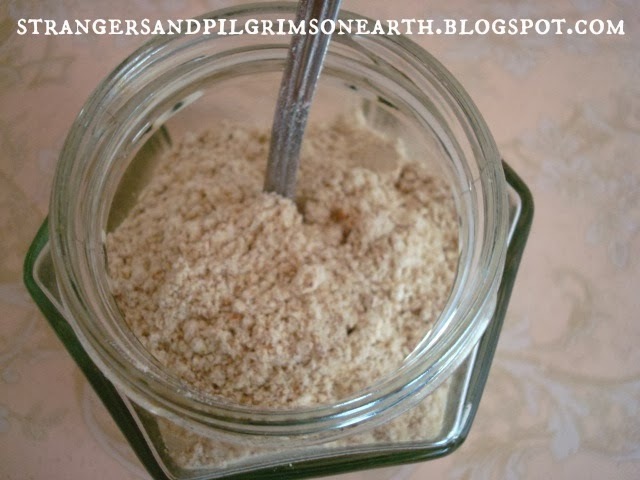 Oatmeal is very soothing and softening to the skin while the baking soda neutralizes pH levels and draws out toxins from the body. Orange and tangerine peels are known to help reduce wrinkles, scars, stretch-marks and acne while being pleasantly aromatic. 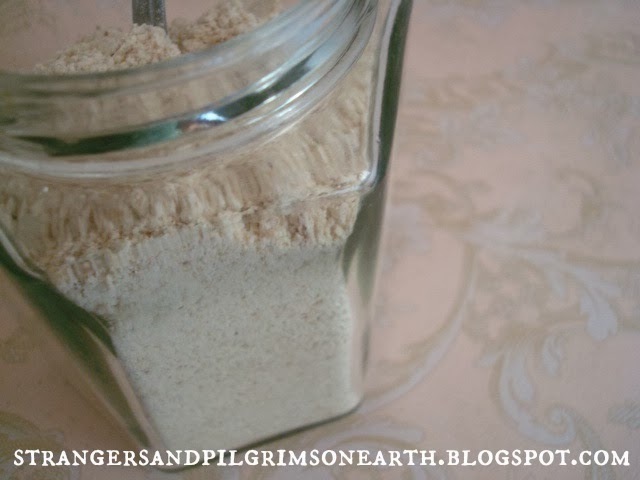 To make, grind up ingredients in a blender until mixture is nice and powdery. Pour inside a clean jar or container with lid. 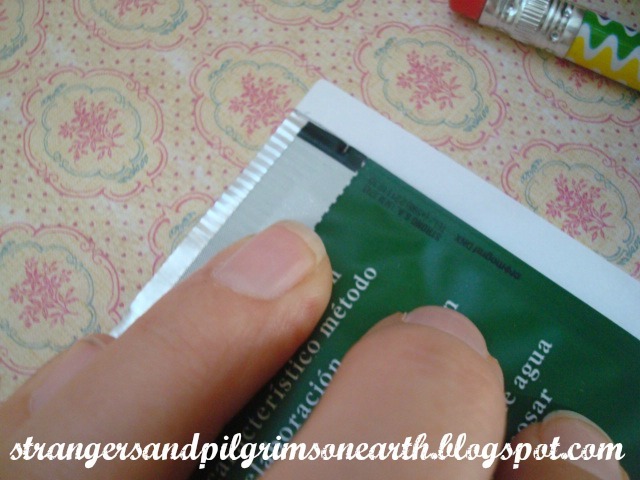 You will find free printable labels for this project here. Optional: Mix in a few drops of orange essential oil or citrus bliss (my new favorite) to your final product. 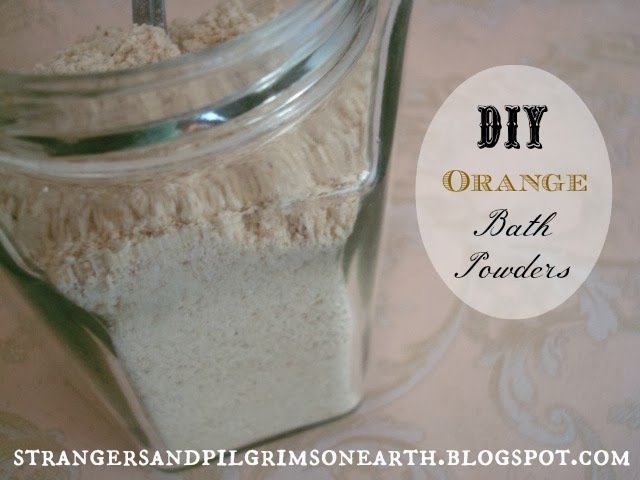 To use, place 1/2 cup of bath powder directly into your warm tub or scoop inside a bath sachet and soak your stress away. You will find more bath and body recipes here. 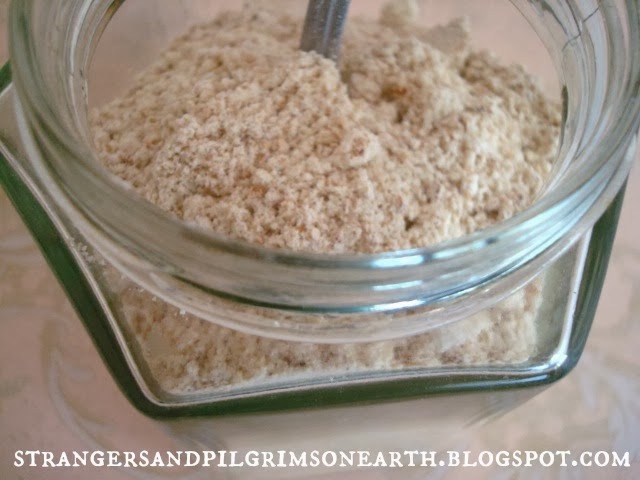 We are also sharing our printable recipe in case you would like to add it to your herbal. Simply download and print from this link HERE. All the fine print. This post may be shared with some or all of the following link-ups: The Art of Home-Making Mondays, Modest Mom Monday's, Monday's Musings, Make Your Home Sing Monday, Good Morning Mondays, The Scoop, Titus 2 Tuesdays, Tuesdays with a Twist, Raising Homemakers, The Homesteader Hop, Wise Woman Link Up, Homestead Blog Hop, Wow Us Wednesdays, Coffee and Conversation, Homemaking Thursdays, Home Sweet Home, Our Simple Homestead, Awesome Life Friday Link Up, Five Star Frou Frou Friday, and Shabbilicious Friday. Thank you lovely ladies for hosting these. This post may contain affiliate links (which are merchant links that help to support this site at no additional cost to you if you purchase an item through them). Some information was gleaned from source 1, source 2, and source 3. Here are some picture studies that you can do with your children to give them a taste of geography and art at the same time. This is such a fun and harmless way to teach these subjects! 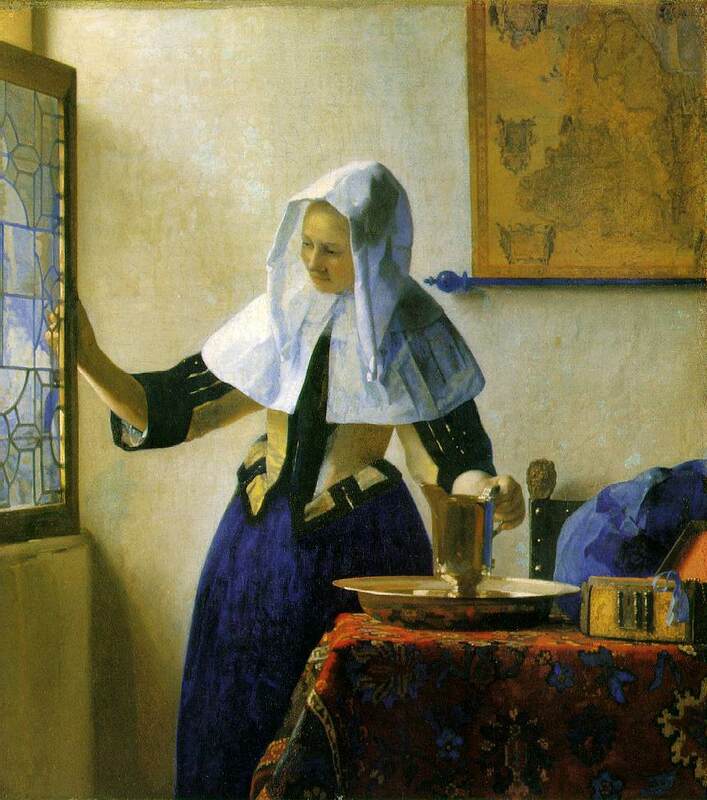 Perhaps you would like to choose one painting to view and one geography concept per week to study? Below are some questions and activities for the children to coordinate with each piece that share basic information about globes. Do you like this artwork? What are your thoughts on it? 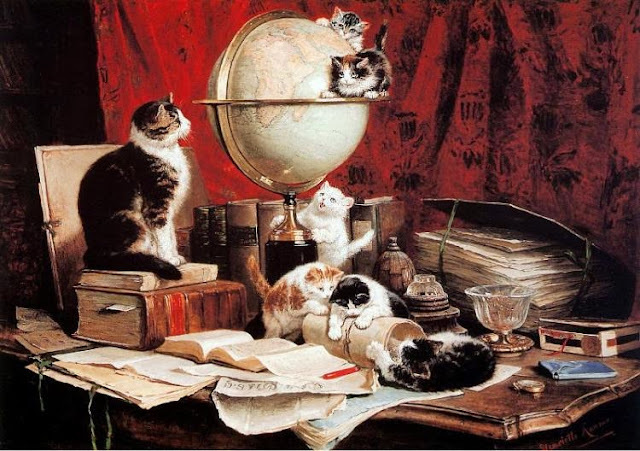 How many kittens can you find in the painting above? Do you think the owner of these items will be pleased when they see this mischief? 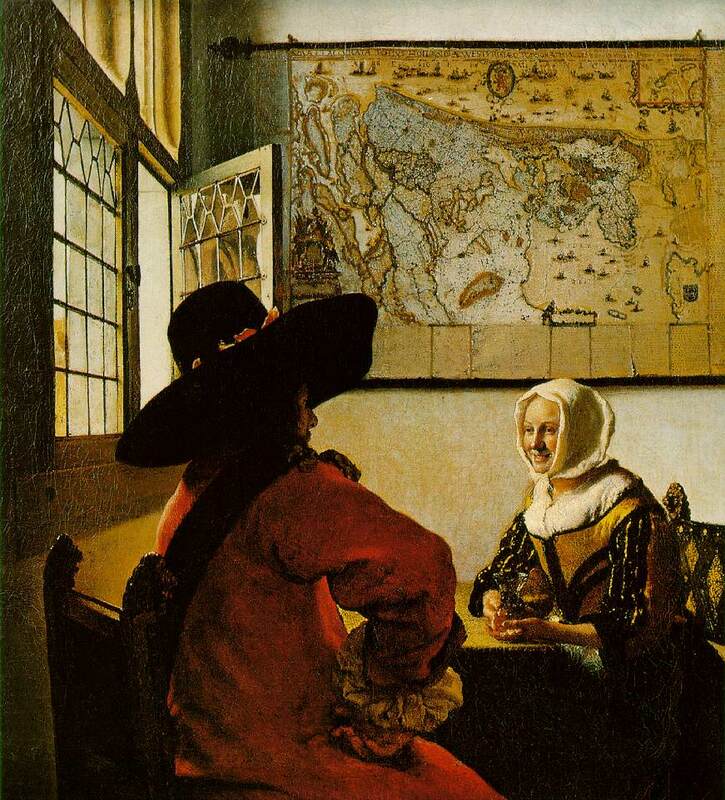 Have you ever spent any time analyzing a globe? Did you know that the earth is really 30 to 40 million times bigger than a globe? Can you point out where you live on the globe? Do you know what Geography is? According to Merriam-Webster Dictionary, it is "a science that deals with the description, distribution, and interaction of the diverse physical, biological, and cultural features of the earth's surface." What does your dictionary say? That means geography is more than maps and globes, it is about the kind of animals that live in certain areas, the culture of the people and knowing what kind of food they eat! Yes, that would be considered geography too! Famous places (such as the Grand Canyon) would be a part of geography as well. What geographical areas by your home do you enjoy visiting? 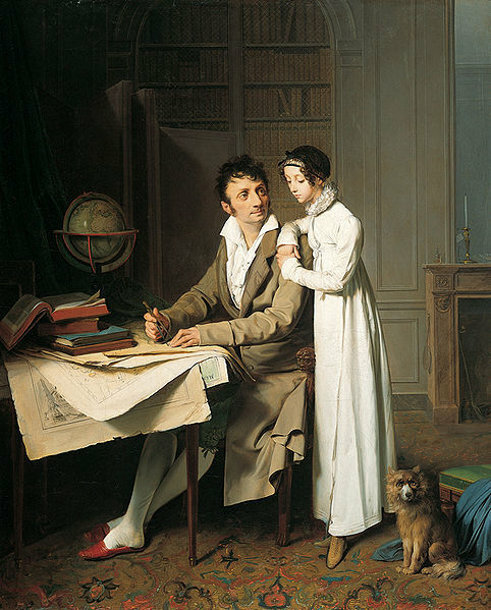 The man in the picture above is a geographer. 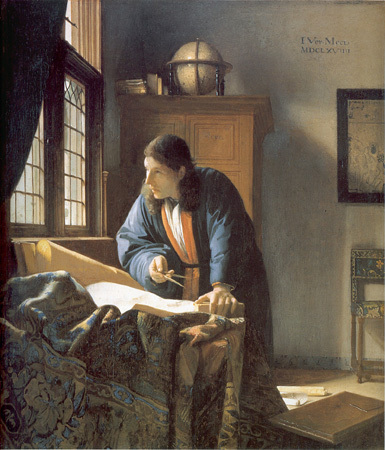 The artist of this painting has a love for globes and maps since about 6 of his paintings feature one or the other in the background. 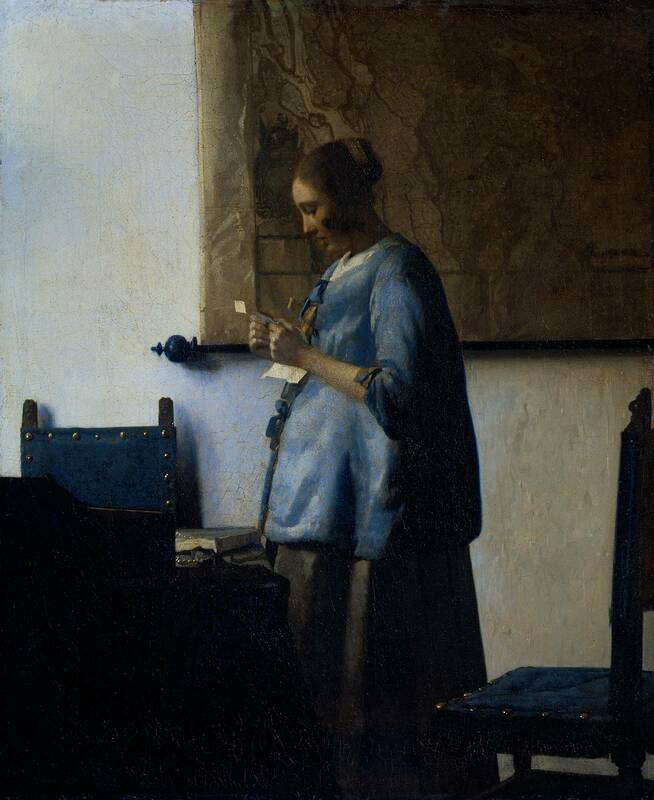 Next time you view a Vermeer painting, see if you can find one. 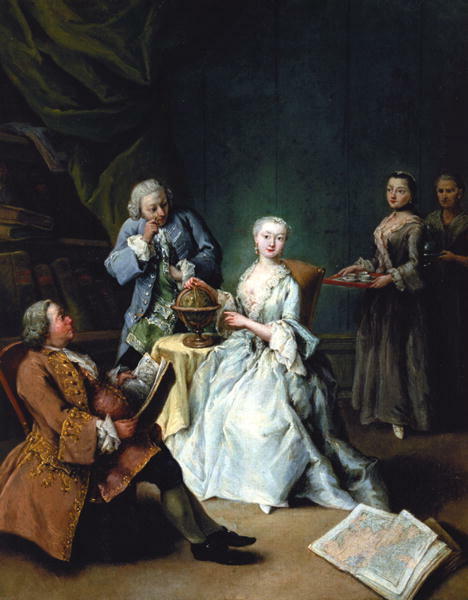 Here are a few to visit: Soldier and the Laughing Girl, Woman in Blue Reading a Letter, Young Woman with a Water Pitcher and The Astronomer. Do you know what a geographer is? (A geographer is a scientist whose area of study is geography, the study of Earth's physical environment and human habitat.) Christopher Columbus was one. Do you know of any others? Print out a picture of a globe on a piece of paper and have the children label in "north, south, east and west". Younger children can just point it out on the globe with your help. Did you know that the line going across the the globe (east to west) is called the "equator" and is just an imaginary line that divides the earth in half? 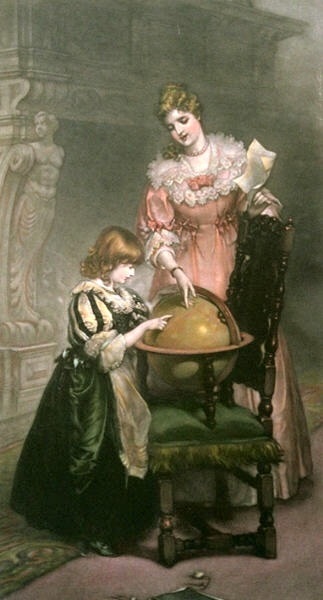 Older children can label the "equator" on their globe print out. Did you know that the northern hemisphere is the top part (north) of the globe while the southern hemisphere is the bottom (south) part? Which hemisphere do you live on? Older children can label both hemispheres on their globe print out while the younger ones may try and point them out. Did you know there is another line called the "prime meridian" which divides the earth another way (going north and south)? It runs up and down starting at the North Pole and ending at the South Pole. Can you find the North Pole? Can you find the South Pole? Older children may label these on their globe print out while the younger ones can point them out. This "Prime Meridian" is technically dividing the globe into two halves which are called the eastern hemisphere and the western hemisphere. Which side do you live on? 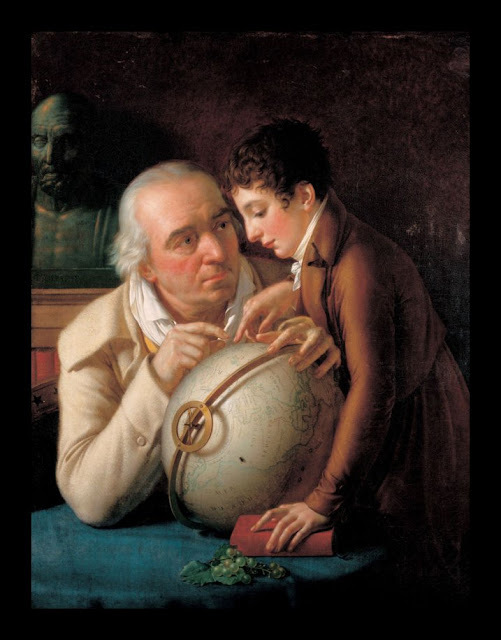 You can also have the older children label the eastern and western hemispheres on their globe while the younger children may just point them out. Do you think the boy above likes to learn? 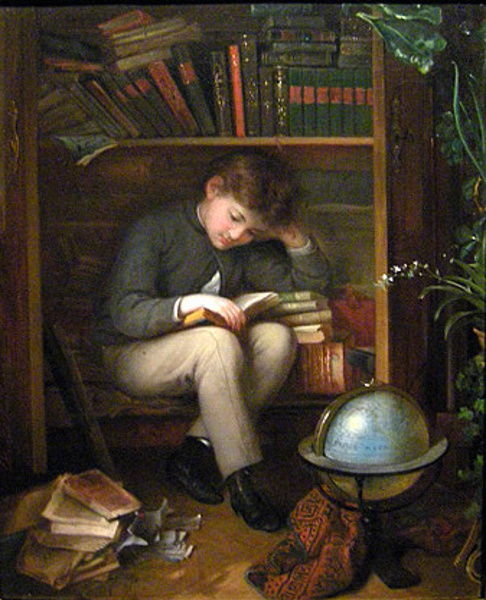 Do you think that the globe in the picture is for him to find all the unusual places he reads about? I do! Did you know that the globe is divided into more sections using imaginary lines? These lines are called latitude and longitude. The latitude lines are horizontal meaning they are the lines that go across the globe (east to west). Can you find these man made lines on your globe? Label them on your globe print out. The longitude lines are vertical lines that go up and down the globe (north to south). Can you find these man made lines on your globe? Label them on your globe print out. Looking at both sets of lines on the globe, you will see that the checkerboard type look is called the "global grid". This grid helps us to locate places on the globe. Older students can be given some coordinates and see if they can find the places you designated for them. Now, have them choose three places on the globe that they would love to visit and see if they can create the coordinates for you! This post may be shared with some or all of the following link-ups: Monthly Geography Hop, Modest Mom Monday's, Homestead Barn Hop, Teach Me Tuesday, Raising Homemakers, Make Bake Create, Wise Woman Link Up, Christian Homemaking, Wildcrafting Wednesday, Frugal Days, Sustainable Ways, Homemaking Wednesdays, Homemaking Thursdays, From the Farm Blog Hop, Farmgirl Friday, Clever Chicks Blog Hop and Deep Roots at Home. Thank you lovely ladies for hosting these. As we load up on oranges and tangerines for the vitamin c punch this winter, don't forget the peels provide their own medicinal benefits. 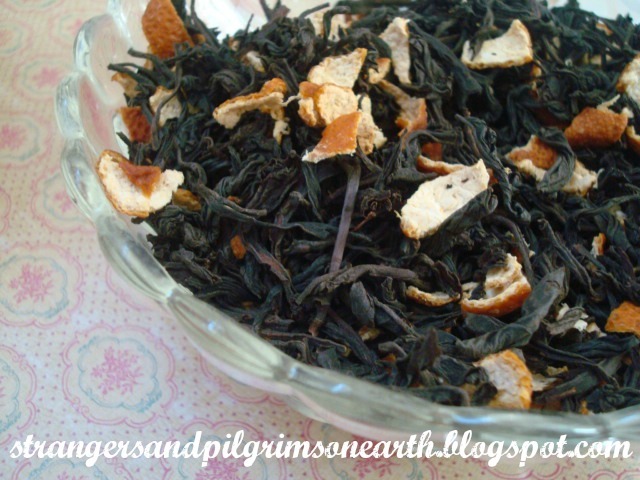 A cup of tea mixed with citrus peels would be a blessing to your health, a delight to the senses and rest for the weary. 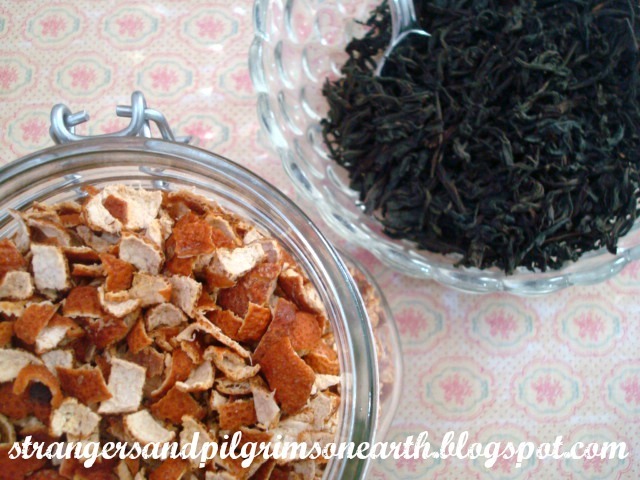 We have dried some tangerine peels (how to here) and mixed them with a loose black tea for a simple effect. We used a ratio of 1 cup of tea leaves to 1/4 cup of dried peels but I encourage you to be creative! Prepare a rainbow variety using lemon, orange and tangerine peels! The Tazo tea company prepares tantalizing blends featuring the abandoned peel for an enormous price. Perhaps these combinations will inspire you? The "Aloha Citrus" is made up of "black tea with pineapple, lemongrass, orange peel & coconut flakes". The "Wild Sweet Orange" blend features a "herbal infusion of orange peel, lemongrass, citrus herbs & licorice root" while the "Passion Tea" is comprised of "hibiscus, orange peel, rose hips and passion fruit flavors". The "Mintly Citrus" combines spearmint, tangerine peel, freeze-dried orange peel, blackberry leaves and orange oil (and they charge $5.95 for 2 oz!). 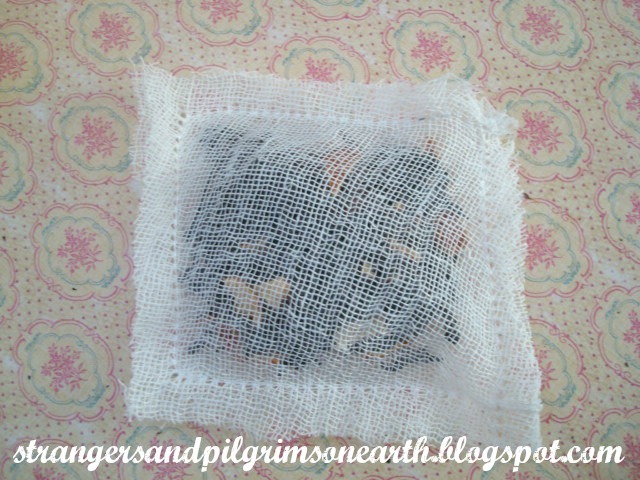 My question is… why have we been taught to throw our citrus peels away? 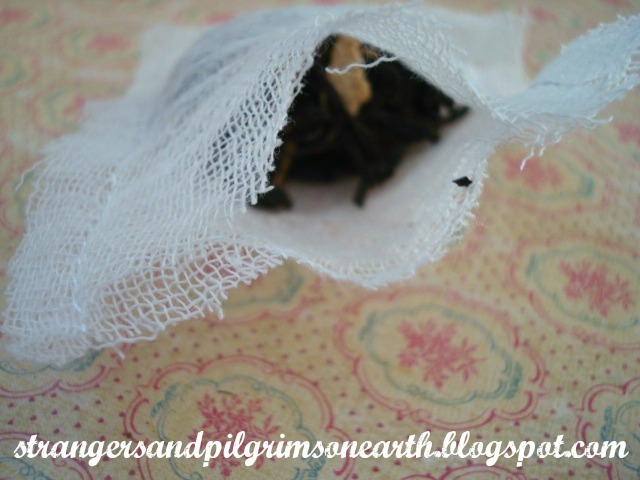 For added "zest", you can make custom tea bags for your "house-blends". Simply make a pattern using a bag of tea (I traced it with the wrapper on to allow room for my seams). 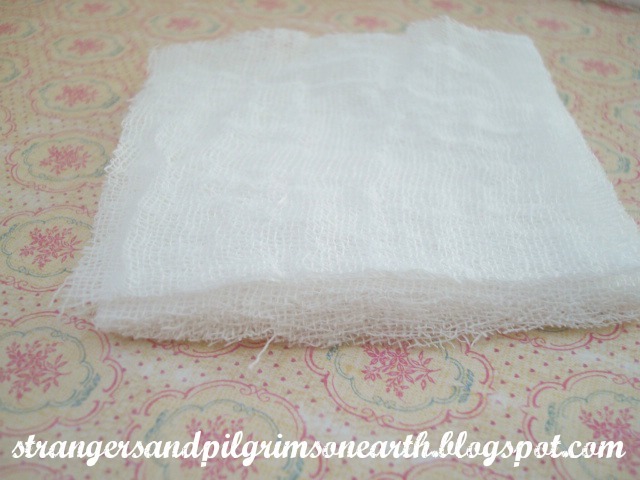 Fold over your fine cheesecloth a few times so that you can prepare many bags with one cut. 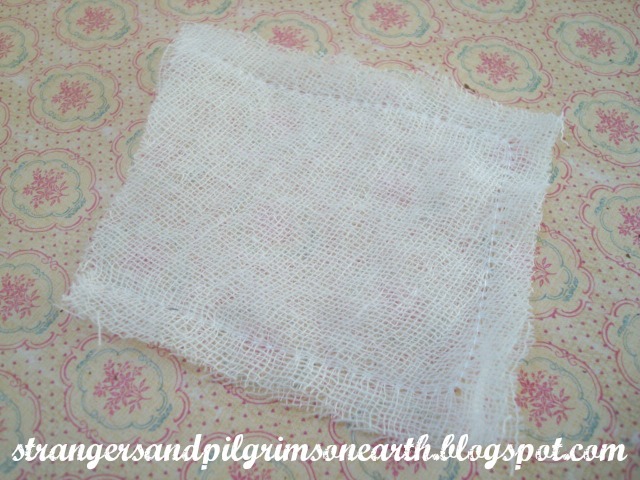 Note: My cheesecloth could have been a bit "finer" but I used what we had. You could also use other transparent fabrics such as organza. ...then sew three ends together (I used a sewing machine). 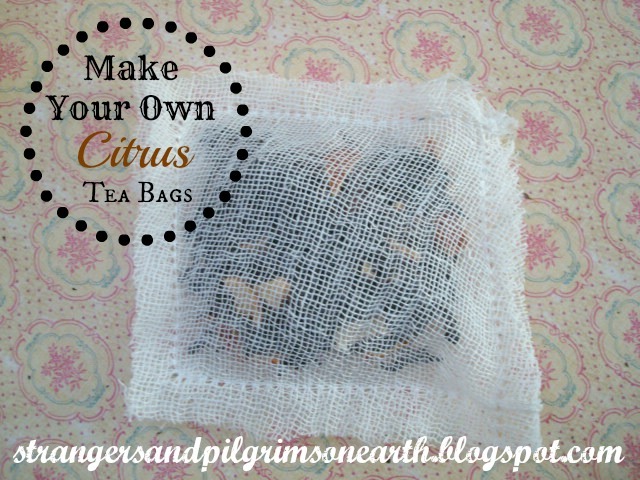 Fill with a generous teaspoon of your custom tea blend and sew the bag closed. Enjoy your exotic tea! This would make a wonderful gift or a great reason to invite a friend over to enjoy a cup together. You could also serve your tea as a "loose tea" by utilizing a tea strainer or French Press. Loose tea is nice to gift in a pretty tin. Eight Ways to Combat the "No $pending Blues"
All the days of her life…"
But the foolish pulls it down with her hands." Organize all your belongings and streamline your home. This will give you a great sense of accomplishment and the realization that you probably already have everything you need. It will also aid you in running your home more efficiently and give you purpose to maintain what you have instead of bringing in more items to upkeep. When you rearrange your furniture, it gives you that "new" feeling without spending a dime. Focus on one room a month. In our home, we have an autumn/winter arrangement of furniture which keeps the fireplace as the center of attention. In the spring/summer, I move everything around the coffee table where we gather with our iced-tea glasses and games. Dig through your attic or basement and repurpose your old cast off's. When you sift through your surplus of goods, you will probably find something that you forgot about that will be "new" to you. A coat of paint does wonders and gives items a fresh identity. We usually have old cans lying in the garage and I make do with the colors we already have (mix the hues to create more volume or a new color). If you really need to purchase something out of necessity, sell off your excess first and recycle your money back into your wallet. Garage sales, eBay and Craig's List are all easy ways that you can market your goods from home. Just use caution and make sure your husband is home prior to accepting a stranger inside or you can always meet in a public parking lot for safety. Altering your clothing is another way to bring the "new" back into your wardrobe. Go through your closet and fix the waistband of that once-favorite skirt, add a new panel of fabric to the bottom of your old skirt and replace boring buttons with pretty ones to give an updated look to an old blouse, etc. Lean times can be the "glean" times. Your local community (library, craft stores, etc.) and many websites offer free classes in which you can learn new skills. These skills will enhance your life, teach you to enjoy hobbies at home and thus remove the need to shop all of the time. These are tools that can be passed down to your children and grandchildren like a perpetual gift that keeps on giving. Ah, the library is the heavenly headquarters for the thrifty minded woman! So many books to inspire you in all areas of life and they are free for the taking! Learn how to ferment, embroider, clean your house, knit, crochet, sew, can, craft, woodwork, etc. 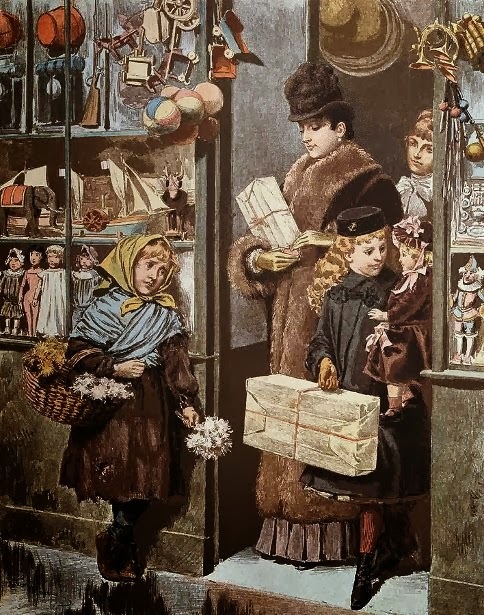 Read inspirational biographies that will teach you to count your blessings instead of spending more money. Knowledge is priceless and yet, it is absolutely free when you spend the time to acquire it! What To Do With Your Excess of …? "a prudent wife is from the Lord" (Proverbs 19:14b). 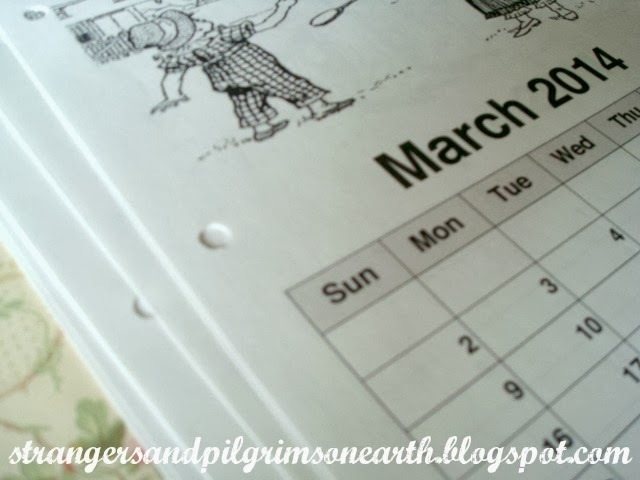 This post may be shared with some or all of the following link-ups: The Art of Home-Making Mondays, Modest Mom Monday's, Monday's Musings, Make Your Home Sing Monday, Marriage Monday, Good Morning Mondays, Titus 2sdays, Titus 2 Tuesdays, Tuesdays with a Twist, Raising Homemakers, Wise Woman Link Up, Homestead Blog Hop, Wow Us Wednesdays, Wildcrafting Wednesday, The Scoop, Coffee and Conversation, So Much at Home, Homemaking Thursdays, Home Sweet Home, Hearts for Home Thursdays, Home Acre Hop, From the Farm Blog Hop, Farmgirl Friday, Front Porch Friday Blog Hop, Simply Natural Saturdays and Clever Chicks Blog Hop. Thank you lovely ladies for hosting these. 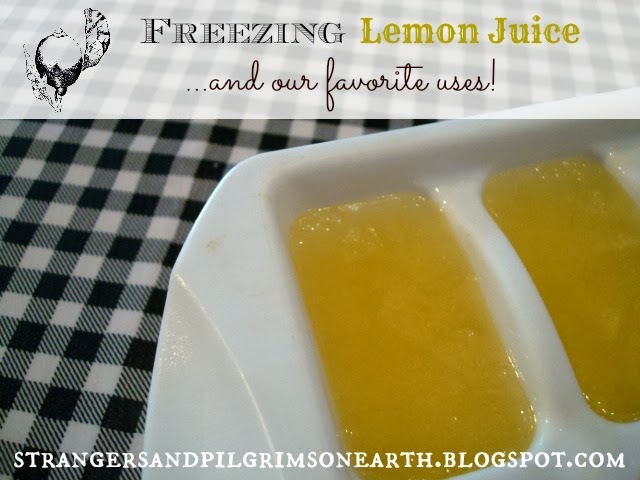 Simply thaw and use as lemon juice in your favorite cooking and dessert recipes. Instead of buying commercially purchased Fruit Fresh, use lemon juice to keep your fruits from browning when freezing pie fillings and such. It is also helpful in treating fruits that are prone to browning for dehydrating and making fruit leathers. To make your own citric solution, simply add two cubes of lemon juice to every quart of water (stir until dissolved). Let your fruit soak in the solution for at least 5 minutes prior to draining (keep apples in liquid until you are ready to use them). Use cubes to make a buttermilk or sour cream substitute. Drop one lemon juice cube into a glass measuring cup (let it thaw), add enough milk to bring the liquid up to the two-cup line and let sit five minutes. Use as much of this "buttermilk substitute" as your recipe calls for. Use your surplus in canning recipes when it calls for lemon juice (though I must add that the canning authorities claim you need to use commercially packaged lemon juice). Use the thawed juice to make "honey lemon cough syrup" when the need arises. Thaw your extra juice for many of these "basic household uses". When the weather warms, place them in water as ice cubes to quench your thirst or make a batch of lemonade with them. Blend cubes up with water, honey and frozen fruit to make lemonade slushies or make your own "frozen lemonade concentrate". Add the lemon cubes to flavor and chill a pitcher of iced tea. What do you do with your excess lemon juice? This post may be shared with some or all of the following link-ups: Modest Mom Monday's, Make it Yourself Mondays, Homestead Barn Hop, Natural Living Tuesday's, Teach Me Tuesday, Raising Homemakers, Make Bake Create, Wise Woman Link Up, Christian Homemaking, Wildcrafting Wednesday, Whatever You Want Wednesday, Frugal Days, Sustainable Ways, Homemaking Wednesdays, Homemaking Thursdays, From the Farm Blog Hop, Farmgirl Friday, Clever Chicks Blog Hop and Deep Roots at Home. Thank you lovely ladies for hosting these. Idea for the buttermilk substitute was found here. Her skirt rustles in a swishing rhythym with the beat of her athletic shoes on the gravel road. 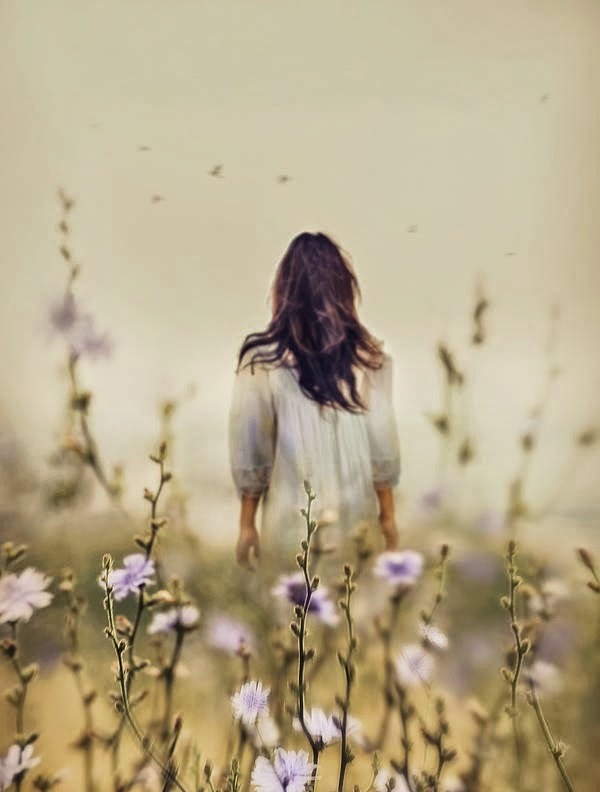 Inhaling deeply of the crisp, fresh air, she feels alive. The flora and fauna is a tonic to her taxed nerves. The birds scatter as she approaches. The trees sway in the breeze, waving to her a morning greeting. Her heart beats and pounds. Clear beads of sweat form on her soft skin like delicate jewels. They sparkle in the sun. She breathes in with purpose and continues on her journey. As she walks, she shares her concerns with her Creator. She feels her burdens buckle, her soul strengthen. This is physical therapy indeed. She knows her role as wife and mother is important. She is indispensable. She must maintain her spirits, she must maintain her health. Where does her path lead? Her purpose is not to be skinny but to be strong. To better serve her family, to better serve her God. just as your soul prospers." This post may be shared with some or all of the following link-ups: The Art of Home-Making Mondays, Modest Mom Monday's, Monday's Musings, Make Your Home Sing Monday, Good Morning Mondays, The Scoop, Titus 2sdays, Titus 2 Tuesdays, Roses of Inspiration, Tuesdays with a Twist, Raising Homemakers, Wise Woman Link Up, Homestead Blog Hop, Wow Us Wednesdays, Coffee and Conversation, Homemaking Thursdays, Home Sweet Home, Our Simple Homestead, From the Farm Blog Hop, Front Porch Friday Blog Hop, Awesome Life Friday Link Up, Five Star Frou Frou Friday, Simply Natural Saturdays and Clever Chicks Blog Hop. Thank you lovely ladies for hosting these. Photo Source. 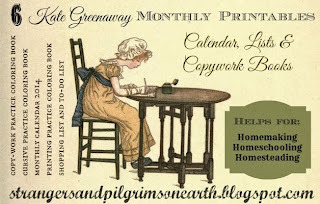 Here is the last set of "Monthly Printables" that we are sharing from our Kate Greenaway Collection. 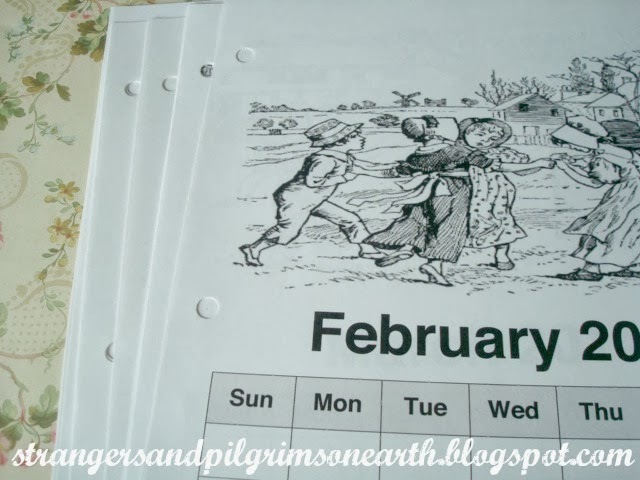 These monthly calendar pages would be perfect to place inside your home management binder. I three-hole punched the sheets and inserted the current month under the "daily section" so that I can conveniently have it in view. The remainder months will be stored in the "monthly work" section until they are necessary. If you have had a rough year full of pain and sorrow, know that with His help, your broken heart can heal. If you live with mounds of regrets, today is the day to be cleansed. You have the choice to become sparkling and fresh. but for him who died for them and was raised again." I hope these printables and the new year will be a blessing to you and yours! 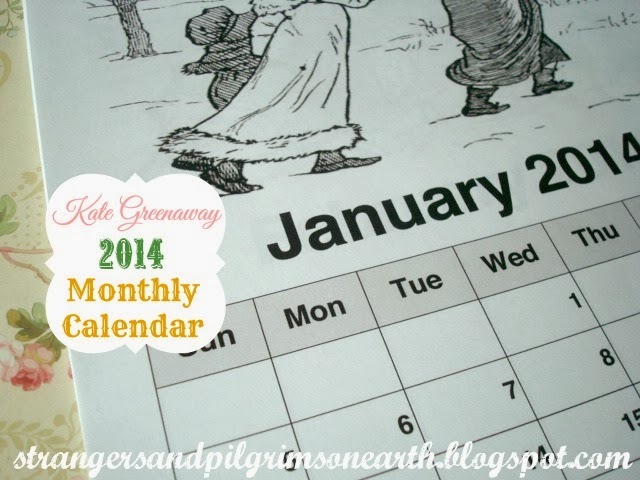 If you have any problems accessing these monthly calendar pages, please let me know. Simply "download" each month that you are interested in from the link below and "save" and "print" (see important printing instructions below). Edited: Visit here for our current 2015 printable calendar. Important Note: When you go to print the PDF file, make sure you find the area that says "size options" and then choose the "fit" option (or the calendar may get cut off on the bottom since it is a larger document). This post may be shared with some or all of the following link-ups: Modest Mom Monday's, Make it Yourself Mondays, Homestead Barn Hop, Natural Living Tuesday's, Teach Me Tuesday, Raising Homemakers, Make Bake Create, Wise Woman Link Up, Christian Homemaking, Wildcrafting Wednesday, Whatever You Want Wednesday, Frugal Days, Sustainable Ways, Homemaking Wednesdays, Homemaking Thursdays, From the Farm Blog Hop, Farmgirl Friday, Clever Chicks Blog Hop and Deep Roots at Home. Thank you lovely ladies for hosting these. Black and White drawings are by the lovely Kate Greenaway. 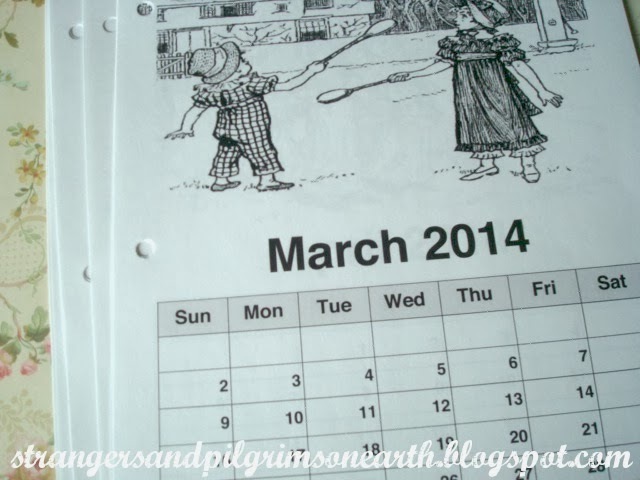 The Calendar software to create these printables was found here.